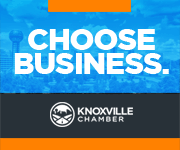 Join the Knoxville Chamber and open the door to opportunity. We build connections, grow business, and engage in community development. No matter the nature of your business, our goal is to help you succeed. Our mission is to drive regional economic prosperity by providing progressive programs and sustainable partnerships. We aim to expand existing business, recruit new companies to the area, and lay the foundation to long-lasting achievements. The Chamber generates new job opportunities in the region and dedicates resources for community development. We aim to draw in new business while fostering the area’s existing economic environment. Every project, whether it be a new recruitment to our community or the expansion of an existing industry, is evaluated on a case-by-case method to determine incentive eligibility. In order for the Chamber’s economic development team to determine if your project is eligible to receive incentives, we will need to know the following general project information: total proposed capital investment, number of net new jobs to be created, and wages of the newly created jobs. Visit the Innovation Valley website to explore all the possible incentives we can offer you.